The Fall rains have arrived after years of drought. With them come the wild mushrooms. I pick end enjoy wild mushrooms, but only after years of foraging with experienced local experts. 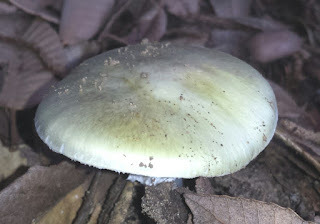 In fact, the most reliable method of determining if a wild mushroom is not only edible, but worth the effort, is to have someone who has been picking and eating the local mushrooms respond to being shown a find - and getting a response like "I will tell you what it is, but you first must give me half and tell me where you found it/them". Mind you, even this method is far from perfect, as PhD students and researchers can be studying inedible or deadly ones. In fact, that happened to me recently - but the mushroom in question has the accurate and appropriate name "Death Cap". Eat it and you will die, slowly and painfully, of liver failure. Death Caps are to be avoided at all costs. Unfortunately, they can be the most common mushrooms in many places and times. In the Santa Cruz Mountains, they are locally abundant right now. They are not food. Most local poisonings from wild mushrooms are from these. The last apples were picked off our trees (19 of them) last week - the season should be over, but it is not! Even though we have not had a frost yet, the Medlars are softening on the trees and their leaves are turning brilliant golds and yellows to celebrate the turning of the season. This is another fruit in the Rose family (apples, cherries, plums, etc... are all in the Rose Family), producing roughly ball shaped fruits often the size of a golf ball or a bit larger. Shakespeare mentions them several times, and they were widely grown across Europe and the UK since Roman times, at least. Unlike apples, that are picked when ready to eat, and despite my son's fondness of raw Medlars, this is a fruit that need to ripen after being picked, much like the soft types of Persimmon. The process is called "Bletting", but in a pinch fresh fruits can be peeled and boiled for about half an hour in water. Today we picked our first Medlars of this season, and immediately processed them into a simple but very tasty jam - a little like apples, a hint of ginger, a hint of cinnamon, but really quite it's own unique and wonderful flavor. 1. 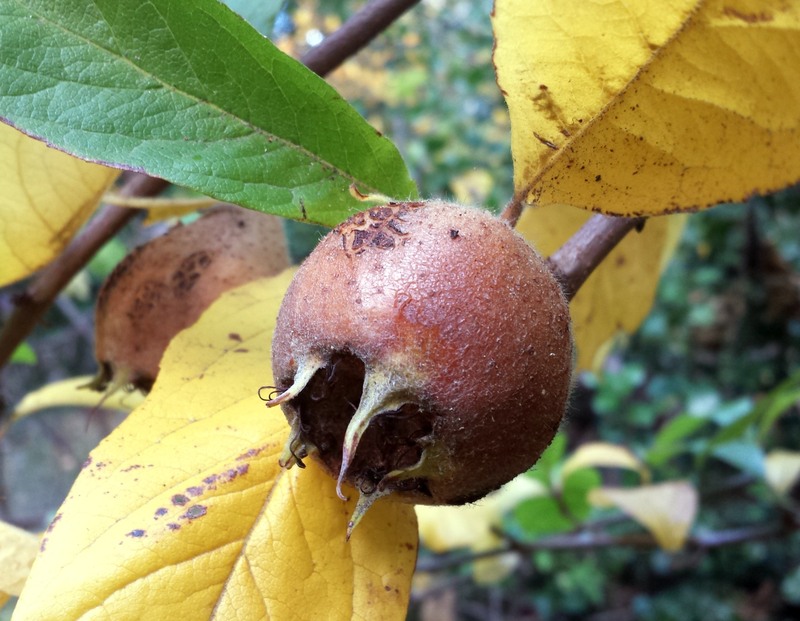 Using a sharp knife, cut each medlar in half from the stem end through the center of the flower scar. Throw out ones that have rotted or appear questionable - they should be firm to slightly soft. These have big seeds embedded in the flesh, so be careful when slicing in half. 2. Peel the skin off each half-medlar. Put the peeled medlars immediately into a pot of water, warm or cold, to prevent browning. 3. When about 3 cups of medlars are in the pot, cover it and bring it to a gentle boil. 4. Turn down the heat and simmer for 30 minute to an hour. Do not let them dry out! 5. Turn off the heat and allow to cool to around 100F or so - whatever temperature that leaves your hands comfortable handling them for the next step. 6. Place the medlars in a blender and cover with liquid they were boiled in. If not enough remains to cover them completely, add more water. 7. Grind at a VERY low speed until a paste has been made. The reason to use a low speed is to not tear tough chunks out of the seeds. 8. Pour the blended medlars through a coarse metal colander - the coarsest that will keep the seeds and pass the pulp. Press extra pulp from the mash by pressing with a spatula or spoon. 9. Collect the pulp. It should be around two cups if you measure it. 10. Put the strained pulp back into the simmering pot (if there are no seedy parts left in it, or use a fresh pot). 11. Add two cups of sucrose (cane sugar). Do not use a sugar substitute, or any other kind of sugar or the results can be a syrup instead of a jam. 12. Get a clip-on-the-edge-of-the-pot metal candy thermometer. 13. Bring the medlar-sugar mix to a boil at high heat, uncovered. Stir constantly from here on. 14. Boil until the temperature of the jam reaches 220 degrees Fahrenheit. The mixture will change transparency around 210 Fahrenheit, becoming more transparent. If you stop at 210, it is likely you have a tasty syrup. If you go to 220, you most likely will have a successful jam. 15. Remove from heat and cool, uncovered, until it sets. 16. Turn out into a bowl and serve with meat dishes that would normally take Cranberry sauce. Alternatively, you can jar the jam - look up normal procedures for fruit jam, like strawberry, and follow those procedures. 17. Enjoy! This needs no additional pectin to set well, at least in our experience.